Twin turbo Cyclone-Blade technology provides a powerful yet quiet flow of cooling air. 25% quieter and 40% more powerful than similar models, our USB fan keeps you cool quickly and efficiently. Simply plug the included USB cable into your computer, power bank, or any USB port. Forget the hassle of batteries or use of an electrical outlet! Our small USB fan operates at below 30 decibels and uses only 5V of power for ultra low energy consumption. It's whisper quiet, energy-efficient, and eco-friendly. 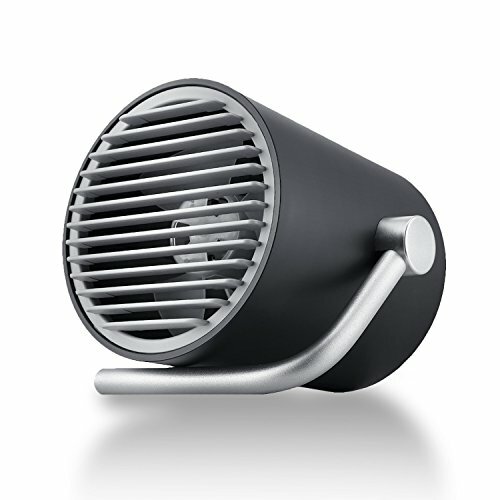 Sturdy and durable aluminum handle provides 180 degree rotation and doubles as a stand, allowing you to position airflow in your desired direction. Slim lightweight design with folding handle for maximum convenience. Rotate the handle for handheld use. When used with a power bank, this device can cool you down anywhere, anytime - use it at a baseball game or while camping! Chic and sophisticated modern design adds a touch of style to any desktop and interior decor. It looks great on your office desk, bed stand, or even in your hands.